As a freewheeling celebration of the limitless potential and life-altering power of the imagination, director Ben Stiller’s remake of the classic 1947 eponymous film (adapted from the original story by James Thurber) is one of the most stunningly creative works to come out of the Hollywood studio system since Stranger Than Fiction. Sublimely lensed by the cinematographer of The Piano (Stuart Dryburgh) with incredible special effects by Soho VFX, The Secret Life of Walter Mitty, which languished in development hell and passed from one helmer to the next for roughly twenty years found its ultimate storytelling team in the form of Pursuit of Happyness scripter Steve Conrad and a top-of-his-game Stiller. Building off what he’s learned and explored onscreen in his own twenty year directorial career, Stiller crafts what is his most truly cinematic work to date. A triumph that was lost in the over-crowded shuffle of too many Oscar-bait films filling the multiplexes alongside blockbusters raking in dough during the holiday moviegoing season, Mitty is an underrated dazzler that‘s sure to gain a larger fanbase on this gorgeous Blu-ray disc. The type of film that plays that much better the second time around, Mitty is especially satisfying to discuss with others while dissecting just how intricately Stiller, Conrad and company managed to weave together so many seemingly disparate threads to craft such a beautiful, humanistic tapestry. Walking a fine balance between a wholesome old fashioned approach both in the structure and characterization with some truly audacious techniques that (while risky) pay off in a big way, Stiller elevates the deceptively simple story in which he also stars. 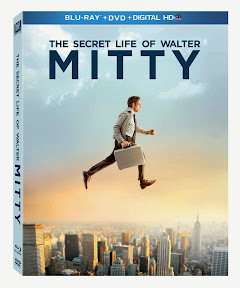 As the titular Life Magazine photo department employee, Stiller’s head-in-the-clouds Walter Mitty finds himself actually embarking on the type of adventures he usually only dreams about, urged on by his crush on a lovely coworker (played by Kristen Wiig). 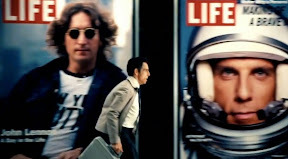 While the heroic journey storyline is often utilized, because Walter is a character who lives out elaborate fantasies in his mind – forever imagining he had the guts to say what he wants or live like he does in his dreams) Stiller uses a bold magical realism laced approach of expressionist filmmaking where for example we’re given the ability to see the things he usually only imagines come to life. As he gradually dares himself to act as the film continues, Walter’s real life becomes far more extraordinary than his wildest daydream as evidenced by the way he sees Wiig’s face cheering him on at different points along the way including a staggering sequence wherein she sings “Ground Control to Major Tom” and it results into a big veritable leap of faith for Walter. That leap of faith comes at a pivotal moment, taking the viewer along for the ride as we realize that the more he participates in life, the more we discover that every daydream he’s had foreshadows something that will pay off later in an unexpected way. Paying homage to the world of mysteries with various clues that help reveal the larger truth – acknowledged aloud first by Wiig when she gives Walter (and by extension us) key wisdom learned in her mystery writing class – Mitty is a marvel. Using creative storytelling to the absolute fullest and transcending its rigid scripted confines to make a much more layered work, The Secret Life of Walter Mitty should appeal to those who responded to the same blend of old and new, visual and written spinning of a good yarn on display in everything from Amelie to Eternal Sunshine to the Spotless Mind. A wholly satisfying picture that marks his most inventive work thus far, with Walter Mitty Ben Stiller has done the unthinkable; he’s turned a studio remake into a big budget art movie with multigenerational, universal appeal.